Taking a manual approach to school bus routing is too time-consuming and cumbersome to truly achieve a high level of efficiency. Without automated, real-time reporting, you lack the necessary insight to keep your students safe and accounted for. Our routing software also helps you make informed decisions when routing deviations occur. BusBoss provides a range of services that come together into a comprehensive transportation management solution. Create unlimited “what if” scenarios to contrast and compare your current route costs versus the optimized route costs with BusBoss route optimization software. 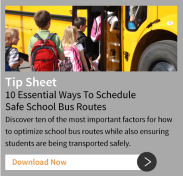 Access real-time information via your BusBoss routing and scheduling software related to student security threats, incident reporting and gaps in critical information. Take a measurable approach to bus route optimization with our diagnostic methodology that identifies the strengths and weaknesses of your school bus management. 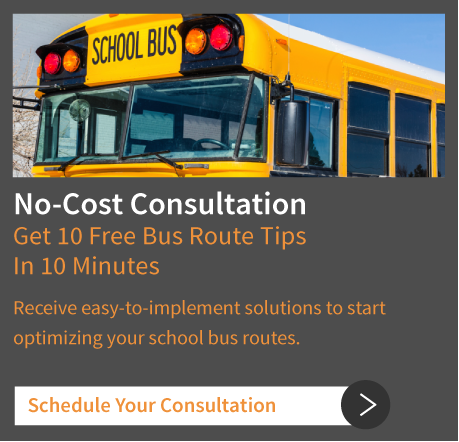 Start saving money and improving your school bus routing efficiency right away with our quick-start, 21-day implementation program. Receive ongoing support for your BusBoss routing and scheduling software with our follow-up protocol for training, maintenance and troubleshooting. Discover new avenues for your transportation management solutions with a variety of built-in and customizable reports to analyze your school bus routing data. With BusBoss transportation management solutions, we put you in the driver’s seat so you have total control over your school bus routing.